Spoiler Alert – if you consider yourself even remotely feminist or if you were born sometime in the last 50 years, continue reading only if you’re willing to have your hair burst into flames. With all apologies to Gloria Steinem, I had to share the following group of hankies. 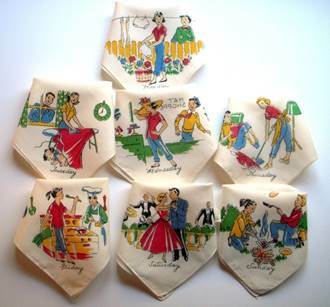 Oftentimes handkerchiefs came in sets of seven, one for each day of the week. 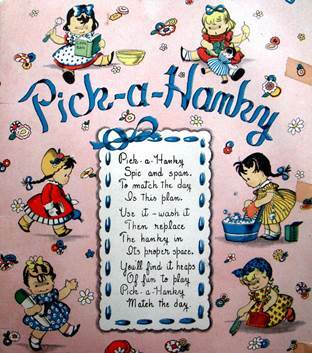 Children’s handkerchiefs in particular often contained a lesson for the day, or inspirational reminders. On this cover (and on the hankies inside) the little girl is cooking, sewing, washing, sweeping, ironing and going to church. She’s learning how to be responsible, and hopefully self-sufficient. 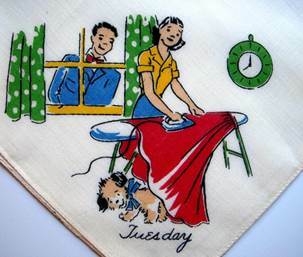 We’ll cover children’s daily hankies in another blog, but since we’ve just celebrated Mother’s Day, I had to include a set of Day-of-the-Week handkerchiefs, to remind us of what a typical week for mom looked like. 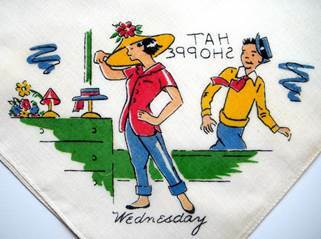 At first, I thought the Monday hankie simply showed friendly neighbors talking over the fence. Either that, or he’s voyeuristically watching his neighbor dry her “delicates.” Seen within the context of all seven hankies, however, we soon ascertain that these young people are boyfriend/girlfriend, or at the very least, he has a crush on her, as he shows up day after day. On Monday, our suitor keeps his gal company while she hangs up laundry. On Tuesday, he smiles a big hello while watching his gal iron yesterday’s wash. Let’s hope that’s 8:00 a.m. on the clock, not p.m., and she won’t be ironing all night long. Note the faraway gaze in her eyes. Methinks she’s neither reveling in the joys of wrinkle removal, nor dreaming of a trip to the soda shop with her suitor, but instead may be picturing herself on a beach far, far away. On Wednesday, our girl gets a break, and visits Ye Olde Hat Shoppe, today’s equivalent of hitting the mall. And there he is again, presumably just passing by and hopefully not stalking. With the hat and hairstyle, he’s a bit reminiscent of Dagwood Bumstead. On Thursday, we find a new lady in his life, sporting a sleek page boy hairdo, and looking suspiciously like his mother. After having watched his girlfriend wash and iron for days, our handsome beau finally gets into the spirit of housework himself, as he gingerly lifts his feet a few inches off the floor so mom can mop. Atta boy. What a trouper! 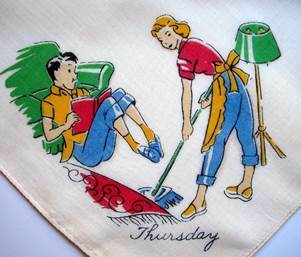 It’s fine to give the kids chill time, as long as they, too, get their shift with the mop and broom at some point. If not, you may find you’re a lady-in-waiting to the prince or princess permanently. Case in point from my own experience: When I lived in Denver, our downstairs neighbor, a perfectly nice guy named Neil, who was around 29 or 30, used to mail his laundry home to New York every week. I kid you not. From Denver. Neil was a strapping 6 ft. tall, able bodied male, perfectly capable of operating a washing machine. I know, because I offered to show him. He declined the offer, because no one could, in his words, “iron like mom.” Got that? Iron…..like…..mom. Ay yi yi! You can’t blame Neil if mom wants to continue to serve as his maid into adulthood. I hadn’t thought of Neil in years until I saw these hankies. I wonder if he ever married, and if so, what role he expected his wife to play? As for the guy on our hankies, perhaps he’s only in high school. He appears to still be living at home. Either that, or he’s a boomerang kid. On Saturday, like a dutiful son, our young man dabs a little brylcreem in his hair and dines and dances with mom at the country club. It’s the least he can do for the woman who has been cleaning house for him all week. Come Sunday, what’s this? Irene of the ironing board has a new beau. She’s in the same outfit, with her hair now in a pony tail, so I’m assuming it’s the same girl, but now she has a blonde beau, and he’s helping with the cooking. They appear to be having a swell time by the campfire, sharing chores and smiling. Come to think of it, remember that wistful look Irene had on Tuesday?Maybe she was daydreaming about her upcoming camping trip. 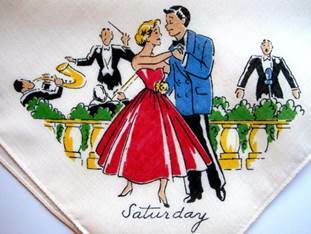 Maybe her brunette beau asked her out for Saturday, she told him she was busy (camping) so like a gentleman, he took his mother dancing.Or – perhaps there is no story line at all to these seven handkerchiefs. Perhaps they just depict scenes from daily life with random players, who knows? The blonde on Sunday could be Irene’s little brother. 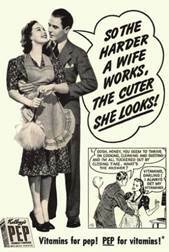 But the washing, ironing, and particularly Thursday’s “Vacuum Lift” certainly fit the picture of life in the 1950’s. 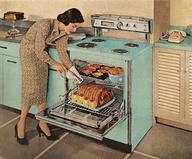 Advertisers showed us the “ideal” life was a house in the suburbs with a washer, dryer and robin’s egg blue oven. Mom cleaned and cooked in stockings and high heels, all the while with a smile on her face and probably humming a tune. It’s been over half a century since these hankies were printed. No one had a computer, much less cell phone or ipad back then. Yet many today still raise their feet for someone to pass the vacuum under their outstretched limbs. One could argue that perhaps our boy’s feet are just scrunched up, and he’s not really lifting. 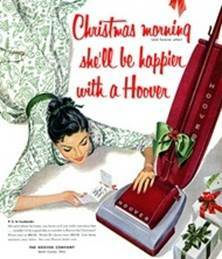 The point is moot, because every single woman I asked admitted that at one time or another she had been on the receiving end of the “Vacuum Lift.” It’s as though the lifter is doing us a big favor and we should say thank you! I guess the gesture does require some thigh muscles. Perhaps we should make “The Vacuum Lift” an Olympic event. For those of you who think I’m still exaggerating, let’s take a little trip into yesteryear to see what mom could expect for Christmas. 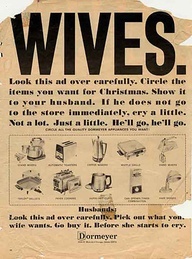 As for appliances, I have friends who don’t own an iron. One told me “I would never carry a handkerchief because I don’t want to have to iron it.” To me, that’s like saying I would never wear shoes because I don’t want to have to shine them. 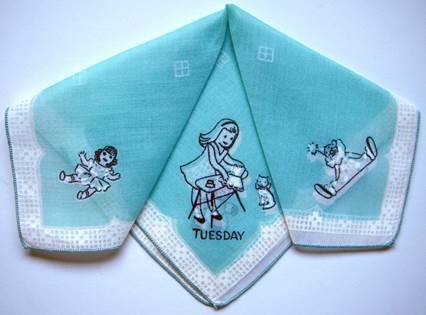 Remember those children’s Hankie-A-Day we saw at the outset? Like our grown ups, Tuesday’s child is ironing. Just for fun I checked, and sure enough, I was born on a Tuesday. 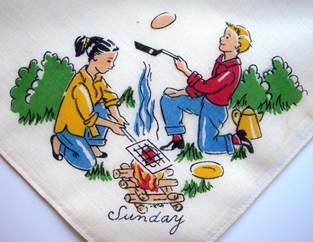 Hmmmmm, perhaps handkerchief collecting was pre-ordained. Ah well… if the shoe fits….. These hankies provide a reminder of how vastly our lives have changed. We even have a vacuum robot, no doubt invented by an enterprising but laggard leg lifter. One thing about daily hankies is they introduce something new and different (even if it’s a task to complete) everyday. At the very least, I hope you, too, can create variety in your schedule, so your days don’t succumb to an endless repetition of routine. My wish for you is that each day can bring you at least one of the following – a little fun, contagious laughter, a warm hug, an unexpected surprise, a thoughtful thank you, appreciation for who you are, and gratitude for what you have. Now that would be a great week…. Nice blog! 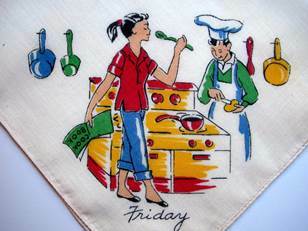 I always enjoyed finding the Days of The Week towels and hankies! I’ve never seen this set before, however. Best, Sue – Zarahs on etsy.